Well, Crist has departed the Great White North for the warmer temperatures of South Carolina. As with her winter visit last year, we got plenty of snow during her her stay, and had a wonderful time eating, relaxing, and shopping… as always, it was sad to say goodbye when the time came to drop her off at the airport. One of our new activities during this visit was making donuts – something that neither of us had done before, and that turned out to be AWESOME. But, before we dive into some delicious donut recipes this week, I wanted to share a breakfast dish I tried out a while back. It’s pretty easy to throw together, doesn’t take too long, and is pretty darn healthy – but it still feels a bit luxurious and fancy, perfect for a lazy weekend morning! 1.) Preheat your oven to 375°. In a small bowl, mix together the chopped artichoke hearts, beans, shallot, olive oil, 1/2 cup grated parmesan, salt, and pepper, until everything is well-combined. 2.) Divide the artichoke and bean mixture evenly between 4 small ramekins. Use the back of a spoon to create a small indentation in the center of the mixture. 3.) Carefully crack one egg into each ramekin, doing your best to keep the yolk situated in the middle. Sprinkle a bit of salt and pepper over each egg, and then sprinkle each egg generously with more grated parmesan. 4.) Place the ramekins on a rimmed baking sheet, and bake for about 12 minutes, until the whites of the eggs are set, but the yolk is still quite runny (if you prefer a more thoroughly cooked egg yolk, just bake until your desired doneness). 5.) While your eggs are baking, place your prosciutto slices in a single layer on a rimmed baking sheet, and bake for about 7-8 minutes in the 375° oven, until crispy. Remove the slices to a paper towel-lined plate, allow them to drain for a few minutes, and then chop or crumble into bite-size pieces. 6.) 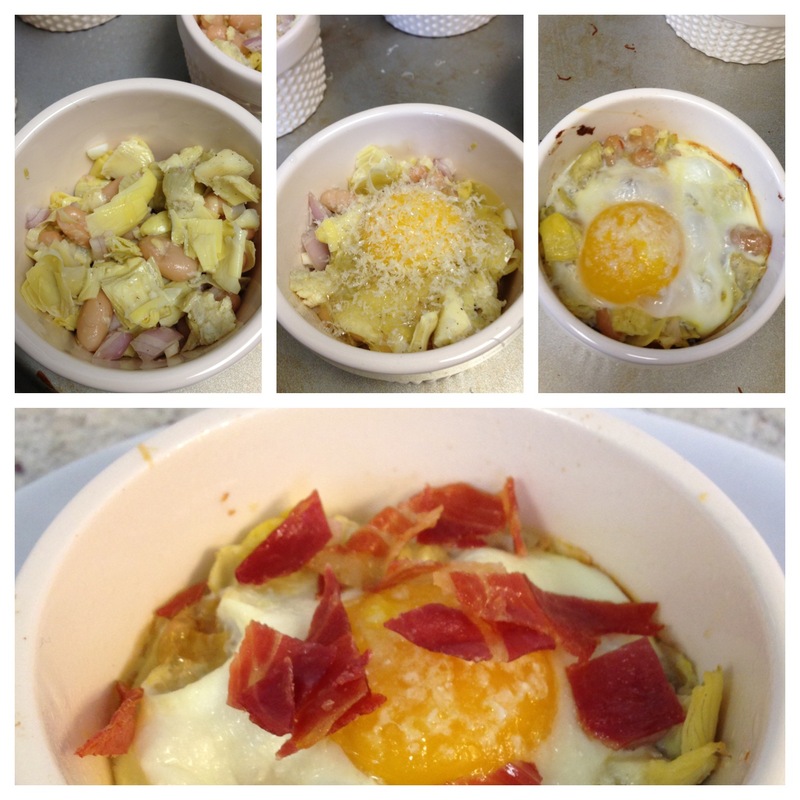 Sprinkle the crispy prosciutto over the baked egg dishes, and serve with crostini immediately. 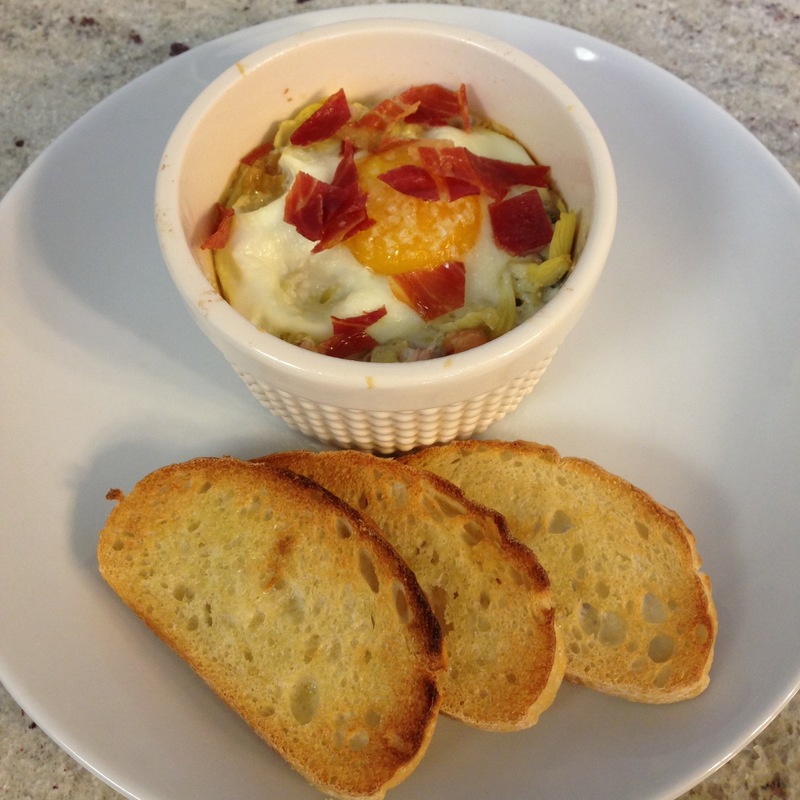 These baked eggs are seriously delicious. The runny yolk breaks over the vegetables and creates a rich, silky sauce that TASTES way more indulgent and calorie-dense than it is. A little creaminess from the white beans, some nuttiness from the parmesan, a bit of sweetness from the shallots – it all comes together to make a deliciously satisfying meal! Enough of this healthy junk; tomorrow we talk about DONUTS! 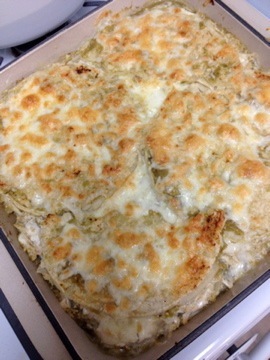 I think my very favorite meal to ever come out of my mother’s kitchen is her green chicken enchiladas. Even as an exceptionally picky child (have we discussed how picky I was as a kid? I basically ate nothing, ever), I loved those enchiladas. They were cheesy and creamy and a bit spicy (or a lot spicy, depending on the particular batch of salsa verde from the Mexican grocery store… every once in a while we got a good, if unexpected, sinus clearing). I’m not sure what kind of voodoo magic my mom uses in her enchiladas, but I’ve never been able to replicate them exactly; so, rather than driving myself up a wall trying to make them exactly right, I finally just decided to put my own little twist on the recipe. My version is slightly different, but delicious in its own way; most obviously, it’s more of a casserole than actual enchiladas. Many, many attempts at rolling enchiladas and having the damn tortillas crumble in my hands (YES, I’ve asked my mom how she does it, and NO, I still can’t make it work), and I’ve finally given up. Casserole it is! *If you use Pinterest, you’ve likely seen a million pins talking about how you should shred your chicken in your stand mixer. Quite frankly, this grossed me right out when I first read it – but, lucky for me, a friend of mine tried it and said it worked really well, so I got up the nerve to try it… and it. is. AWESOME. It cuts the tedious chore of shredding a pound of chicken from 20 minutes (and sore hands afterward) to about 30 seconds. I bake my chicken (in this instance, seasoned with salt, pepper, and garlic powder; baked, covered, for about 30 minutes at 350°), let it cool for about 5 minutes, and then pop it into the bowl of the mixer, fitted with the paddle attachment. 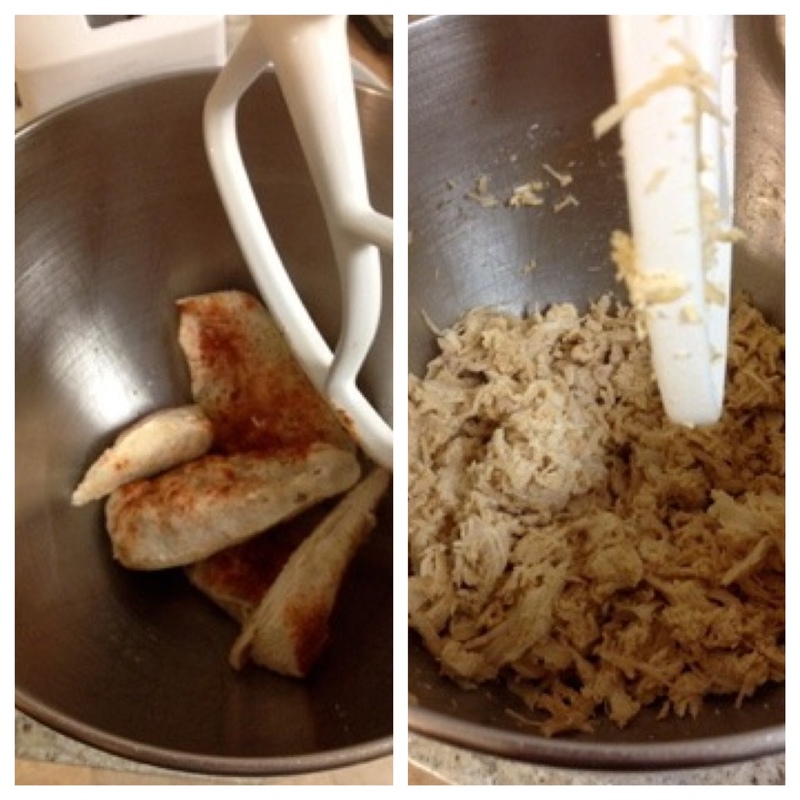 Turn the mixer on to low, and 30 seconds later, you have perfectly shredded chicken. **I prefer the Herdez brand, and it can usually be found in the Hispanic foods section of your grocery store. If you can’t find Herdez, use any other brand you enjoy! 1.) Heat a pot over medium heat, and add a teaspoon or two of olive oil to to it. Once it’s hot, add the onions, and cook until translucent, 2 to 3 minutes. Add the garlic, and cook until fragrant, about one minute; season with a pinch each of salt and pepper. 2.) Add the shredded chicken, and one jar of the salsa verde, and reduce the heat to low. Keep the mixture over low heat to keep it warm. 3.) Heat a small skillet over low heat, and add some of the second jar of salsa verde to it, so it’s about 1/2″ deep. 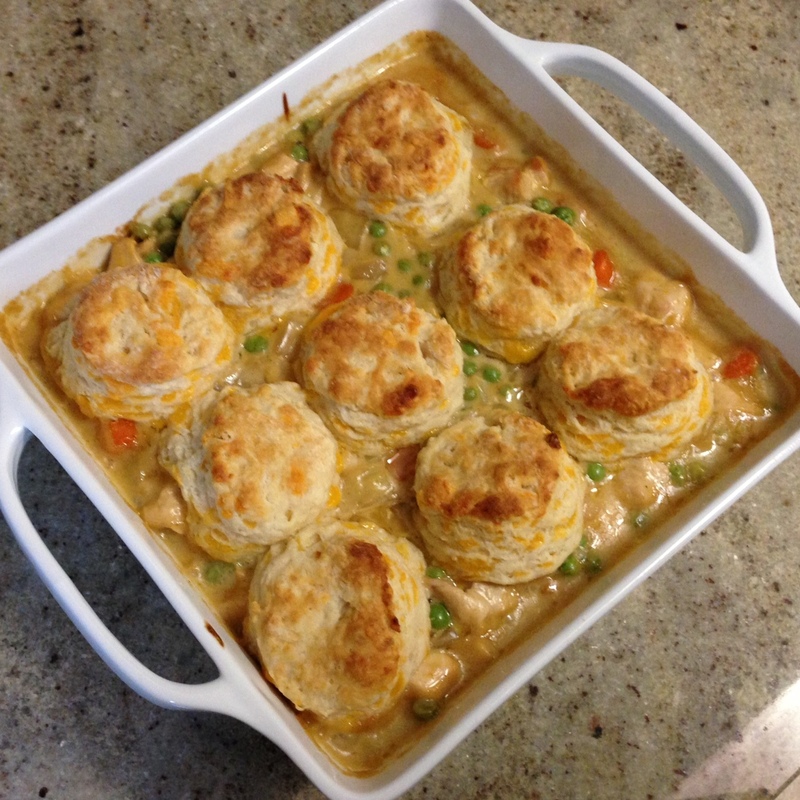 While that sauce heats through, preheat your oven to 375°, and grab a casserole dish (I used a 9×9 dish). 4.) 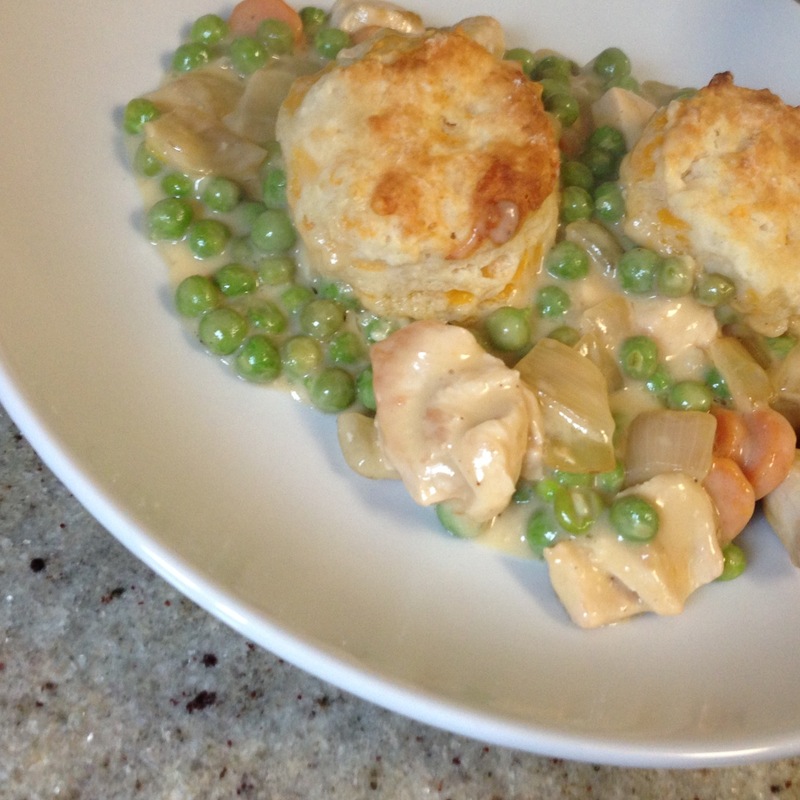 Spoon a small amount of the green sauce/chicken mixture into the bottom of the dish, and spread it evenly around. Then, take a corn tortilla, and put it into the small skillet filled with sauce; let it sit in the sauce until it’s evenly coated and slightly softened, just about 10-15 seconds. Remove it from the sauce, and lay it in the dish, using as many tortillas as you need to create a layer (I used three per layer, ripping one in half to sit the dish better). You’ll repeat this with all the corn tortillas, layering them into the dish as you go, and adding more sauce to the skillet as needed. 5.) Spoon 1/4 of the chicken mixture on top of the tortilla layer, and spread it out evenly. Spread 1/4 of the sour cream on top of that, doing your best to spread it out; top with 1/4 of the cheese. Continue layering until you use all your ingredients, ending with the cheese. I like to lightly mist the cheese with olive oil, to help it brown in the oven. 6.) Bake for about 30 minutes, until the cheese is melted and browned; turn the broiler on for the last minute or two, if needed, to brown the cheese. 7.) 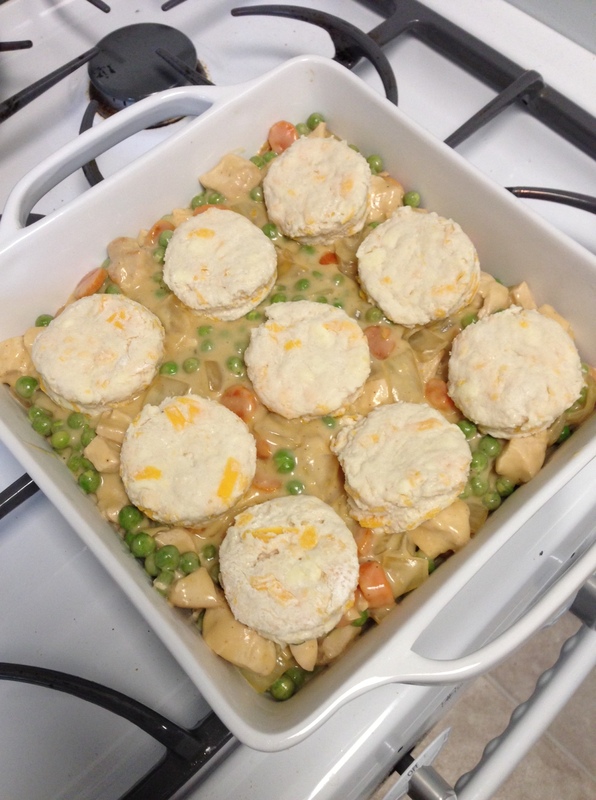 Allow the casserole to sit for at least 5 minutes, so it will set up a bit. Then, cut into squares, and serve! You can serve this with a side of refried beans, or some rice, or chips and guacamole… or whatever you like! I served ours with a side of chili lime-seasoned cauliflower (recipe forthcoming), because I really wanted to have a slightly lighter side dish; of course, Crist wasted no time in telling me (repeatedly) that serving cauliflower with Mexican food was “gross”, but I paid her no attention, because we thought it was delicious. Crist comes to visit in 3 days! Good Monday morning to you! I am finally getting back into the swing of things after the holidays and yes, my tree is still up but the ornaments are off and I am not ashamed. Tina is threatening (or promising?) to leave hers up until after I visit there in two weeks, so at least there’s another who holds on to their tree until the last possible moment. There’s a reason we’re friends. Anyway. To the recipes. Y’all know we love a casserole in my household, and a pasta bake is even more well received. 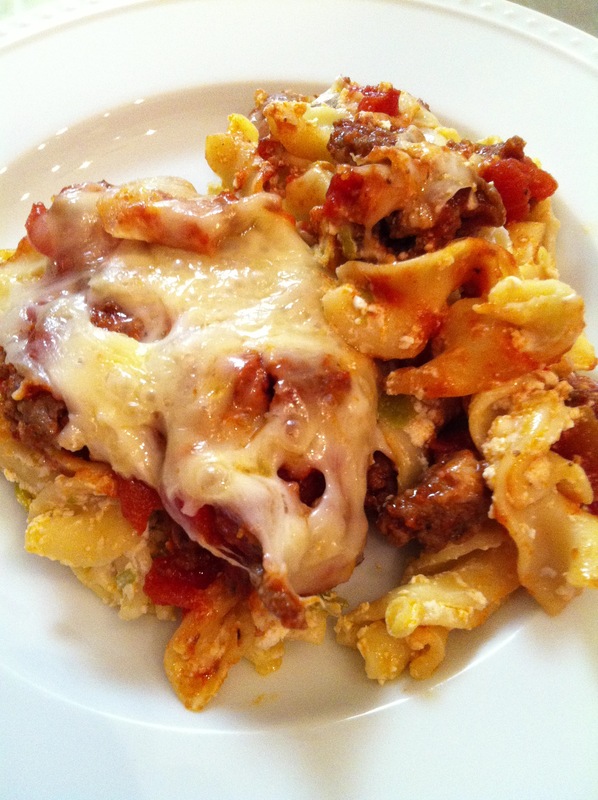 I like to make a casserole for Sunday supper because of the kind of schedule my husband has; it generally leaves lots of leftovers for him to eat whenever he needs a snack. I dropped this off for him at work last night, and I was hardly home before I got an “I LOVE THIS DISH” text. Now, Matt’s usually very complimentary of my cooking but rarely this exuberant. Needless to say, once I got home and fixed myself a portion, I agreed. It’s the strangest mix of ingredients but let me tell you, it works. Once again, a Twitterless Kerri recommendation comes through for us. Cook egg noodles according to package directions; drain. Stir together cooked egg noodles, chopped green onions, and sour cream until blended. 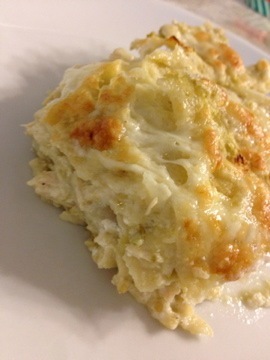 Place noodle mixture in bottom of a lightly greased 9×13 baking dish. 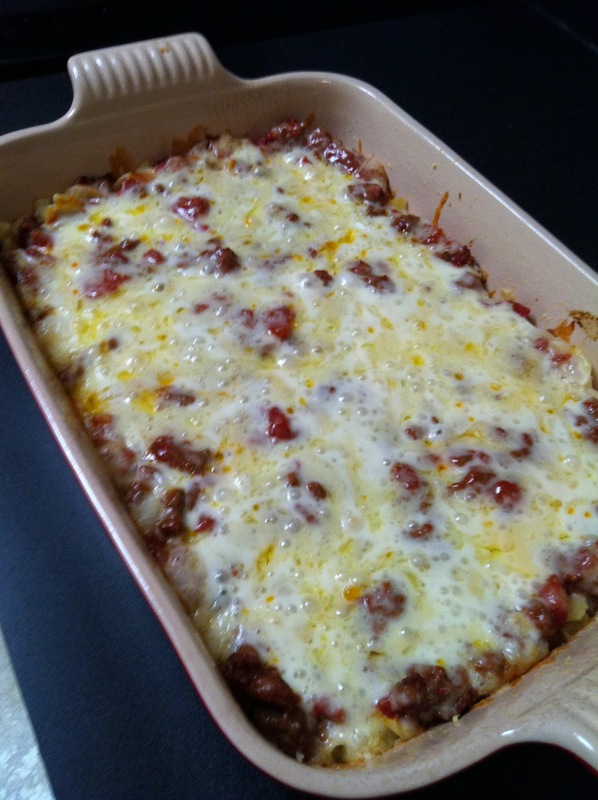 Top with beef mixture; sprinkle evenly with cheeses. Bake, covered with aluminum foil, at 350° for 35 minutes. Uncover casserole, and bake 5 more minutes. Y’all, that was a lot of cheese. And I thought to myself, as studied the mountain of cheeses that I’d grated, that I probably shouldn’t use it all. But what the heck, I did. Matt would likely say I was crazy, but I wouldn’t use that much again. Half a cup of each would likely be more than enough. Also, the original recipe called for 6 oz. egg noodles but I found an 8 oz. bag so I just upped the sour cream a little bit. why yes, that’s a lot of cheese.